The O'Neal School - The O’Neal Pelagics Swim Club is Off to a Great Start! The O’Neal Pelagics Swim Club is Off to a Great Start! 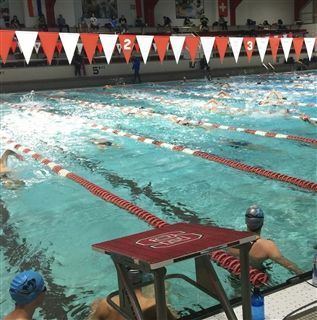 Only six weeks after the start of O’Neal’s USA Swimming certified swim club, two of the three teams of O’Neal Pelagics have made their first appearance at swim meets. The 10-member Senior team competed in the Marlins of Raleigh Senior Kick Off beginning Friday night, Oct. 19th at the Smithfield Recreation and Aquatics Center. The meet continued at NCSU on Saturday and Sunday – Oct. 20-21st. The 15-member Challenger team competed in the North Carolina Aquatic Club IMX Challenge on Saturday, Oct. 20th at UNC-Chapel Hill. The O’Neal Pelagics has a combination of 47 members in three different teams designated by skill level: Imagination, Challenger, Senior. Home of the Pelagics is the Aquatics Center at Taws Hall. The head coach is Jen Schmitz who is also director of aquatics and swim instructor for O’Neal’s PE curriculum.